A bit of sunshine for this snowy day – I got confirmation of our house for this summer in Las Vegas. 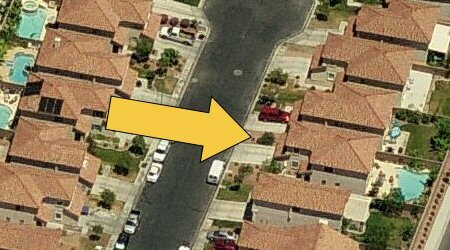 I’m pretty sure this is it – Google Earth showed the address at the same house without a pool, but this version from Live.com looks a bit more up to date. If not, it’s one across the street. It’s the South side of the valley this year; last year it was Henderson and before that Summerlin. Only North Las Vegas to go to complete the collection. I can’t really explain why the thought of that scares me so much, but it does. Our nearest casino will be the Silverton (1.96 miles), but I can’t see us going there a whole lot. Hootie and the Blowfish and the Bass Pro Shop don’t really do it for me, but they do have a must-see interactive fish feeding show in their giant aquarium (home to 4000 tropical fish, so the web site says, and why would it lie?). The next closest is The Orleans (3.60 miles) and the first stop on the strip is Mandalay Bay (3.81 miles). Downtown Las Vegas is just under ten miles away – 18 minutes to drive, I’m told. My version of Streets and Trips isn’t new enough to know about South Point, but that’s a casino with no redeeming features at all. Apart from the equestrian center (currently home to the Home Improvement and Backyard Living Expo, which doesn’t seem to be much to do with horses at all) it’s just a copy of The Orleans but cleverly omitting all of the style.